Injured In A Crash With An Uninsured Driver In Washington State? More motorists in Washington state are driving without car insurance than ever before, according to a study conducted by the Insurance Research Council. The study — Uninsured Motorists, 2017 Edition — estimates Washington's 2015 uninsured motorist rate at 17.4 percent compared to 16.1 percent in 2012. 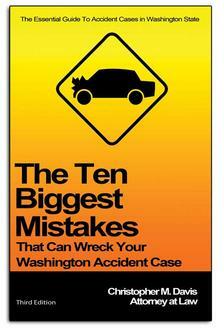 That 8 percent increase places Washington at seventh highest in the country for uninsured drivers. There are approximately 4,407,269 licensed drivers in Washington state, which means there are about 766,864 uninsured drivers in the state. Nationwide, one in eight drivers were uninsured in 2015. The national uninsured motorist average is at 13 percent. The percentage isn't just rising in Washington; the national percentage has been rising since it hit a record low of 12.3 percent in 2010. Despite laws in almost every state requiring auto liability coverage — New Hampshire does not — more and more drivers are breaking the law and failing to get insurance. Additionally, a large percentage of drivers are likely carrying only their state's mandated minimum insurance amounts. With these statistics showing how many uninsured drivers are on Washington's roadways, it's important to protect yourself in the event of a car accident with one of these drivers. Davis Law Group, P.S., the premiere personal injury law firm in Washington state, encourages drivers to purchase as much insurance coverage as they can afford. Uninsured motorist bodily injury coverage: pays the cost of your medicals bills if you're injured in an accident. If you are injured by an uninsured driver and don't have UM coverage, Med Pay coverage, personal injury protection (PIP), or your own medical insurance, you would be responsible for your own hospital bills. Uninsured motorist property damage coverage: pays for repairs to your car if it's damaged in an accident. If your car is damaged by an uninsured driver and you don't have UM coverage or collision coverage, you would have to pay for repairs yourself or go after the at-fault driver in court. Underinsured motorist bodily injury coverage: helps pay for your medical bills if you're hit by a driver who doesn't have enough insurance coverage to fully cover the cost of those medical bills. Underinsured motorist property damage coverage: helps pay for repairs to your car if you're hit by a driver who doesn't have enough insurance coverage to fully cover the repairs. The following states require uninsured motorist coverage: Connecticut, District of Columbia, Illinois, Kansas, Maine, Maryland, Massachusetts, Minnesota, Missouri, Nebraska, New Jersey, New York, North Carolina, North Dakota, Oregon, Rhode Island, South Carolina, South Dakota, Vermont, Virginia, West Virginia and Wisconsin. No matter what type of situation your injury stems from, the capable and experienced lawyers at Davis Law Group will be able to meet with you and compile a plan that will get you the proper compensation necessary for your personal injury. Ultimately, the goal of our law firm is to provide the comprehensive, caring and excellent services for those who are injured and need legal guidance. Depending on how you want the situation handled, things like settlements and the nature of the compensation that you are seeking will be discussed completely and in detail. You will always have a say in the settlement of your case. As your Seattle and Washington state injury law firm, we are here to help. Financial hardships are often a result of unexpected personal injuries or the loss of a spouse or parent. Injuries and lost earners due to Uninsured Motorist Coverage significantly impact a family’s financial well-being. Depending on the severity of the injury, medical bills can become incredibly cumbersome and financially taxing. Do not worry about the fees that you will incur when hiring our accident attorneys. We work on contingency — meaning we don’t get paid if you don’t win your case. Do not settle for a law firm that simply does not know what they are doing when it comes to representing you after you’ve been hurt. We will work diligently to represent all of your needs and get you the best outcome we can.